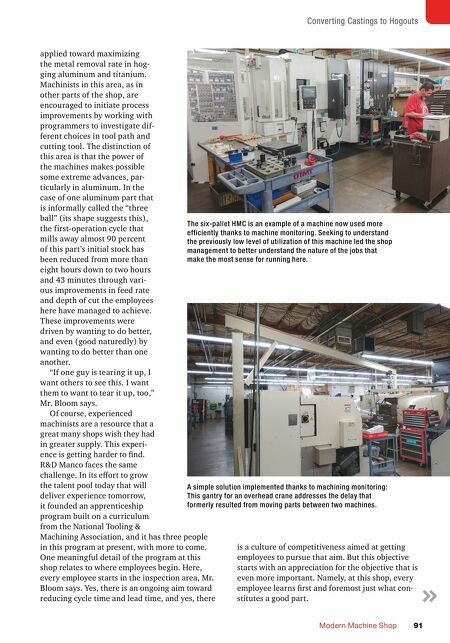 SHOP EFFICIENCY MMS JANUARY 2018 90 mmsonline.com The company management makes clear to the production staff that this kind of judgement is valuable. Indeed, process refinements of this nature on an ongoing basis are valuable. After all, the chance to realize ongoing incremental efficiency improvements for any given job rep- resents one of the most important reasons to take ownership of that job by making it a hogout. To engage this shopf loor experience toward the aim of ongoing process improvement—meaning increased speed and effectiveness at hogging out the metal—a culture of competitiveness is deliberately fostered among the employees. In fact, that aspect of the culture might be the most apparent not in the five-axis area, but in the shop's area for 50-taper machining. 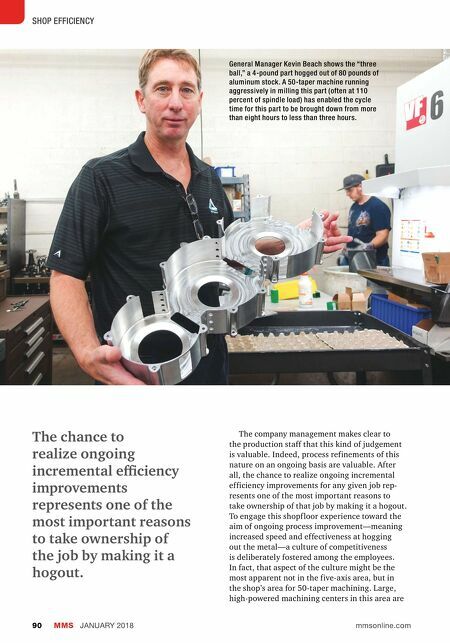 Large, high-powered machining centers in this area are The chance to realize ongoing incremental efficiency improvements represents one of the most important reasons to take ownership of the job by making it a hogout. General Manager Kevin Beach shows the "three ball," a 4-pound part hogged out of 80 pounds of aluminum stock. A 50-taper machine running aggressively in milling this part (often at 110 percent of spindle load) has enabled the cycle time for this part to be brought down from more than eight hours to less than three hours.